81 1934 She also gave a beautiful reading. Secretary Report read and approved. The Sec. read a letter from Mr Cooper a member of the liquor commission in answer to a letter written to him concerning the placement of a liquor store in Grinnell assuring us that our request would be considered. Report of the blotters committee was given. Moved by Miss Bailey, seconded by Mrs J S Stoakes to send for a barrel of empty fruit jars for Benedict Home. Motion carried. Mrs Hess asked that all who could arrange to do so to come June 8th to prepare flowers for Flower Mission Day. Miss Butler suggested that flowers be sent to the County Home. 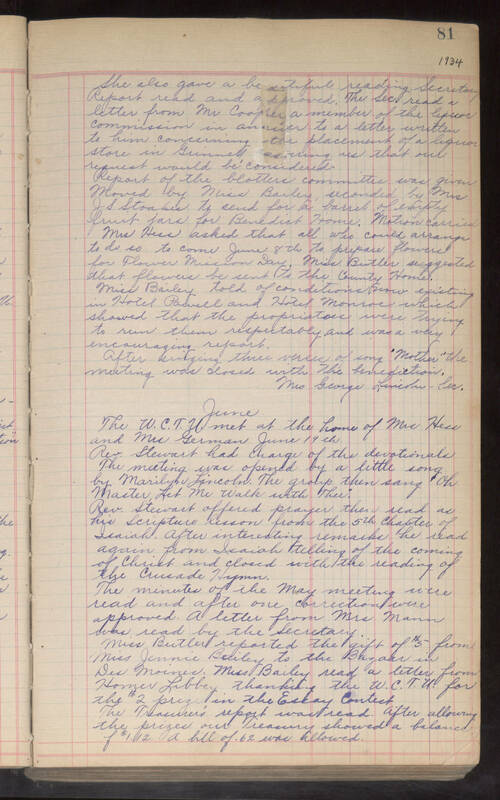 Miss Bailey told of conditions now existing in Hotel Powell and Hotel Monroe which showed that the proprietors were trying to run them respectably and was a very encouraging report. After singing three verses of song "Mother" the meeting was closed with the benediction. Mrs George Lincoln-Sec. June The W.C.T.U. met at the home of Mrs Hess and Mrs German June 19th. Rev. Stewart had charge of the devotionals The meeting was opened by a little song by Marilyn Lincoln. The group then sang "Oh Master Let Me Walk with Thee." Rev. Stewart offered prayer then read as his Scripture lesson from the 5th chapter of Isaiah. After interesting remarks he read again from Isaiah telling of the coming of Christ and closed with the reading of the Crusade Hymn. The minutes of the May meeting were read and after one correction were approved. A letter from Mrs Mann was read by the Secretary. Miss Butler reported the gift of $5 from Miss Jennie Bailey to the Bazaar in Des Moines. Miss Bailey read a letter from Homer Libbey thanking the W.C.T.U. for the $2 prize in the Essay Contest The Treasurer's report was read. After allowing the prizes our Treasury showed a balance of $1.12. A bill of .62 was allowed.